Storage units hold our valuables and we trust them with things we really care about. However, are storage units really secure? At Jiffy Storage, we make security our top priority. So yes, our storage units with their unique features are definitely secure! We make sure there are CCTV cameras at every entry point of our vaults. Our storage units are password protected, which means only those who have the pin code can enter the units. Only well lit, completely official real estate properties are maintained by us. Add a stringent employee protocol to these features and you have a theft-proof, secure storage unit at hand. However, security is a two-way endeavor. We do our best to ensure no breaches from our side and expect the same from you. 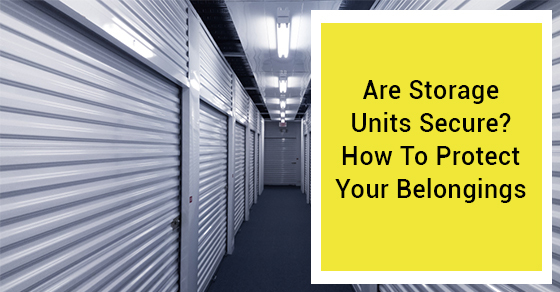 Here are a few things you must always keep in mind before investing in a self-storage unit. For most people, insurance often seems unnecessary and that’s where they go wrong. You have absolutely no control over fire and floods. Secure your goods (at least monetarily) from not only burglars but natural calamities. While insurance policies for storage systems are not compulsory, it is best to not take chances. They usually cost less than $10 per month and provide you coverage for accidental damage to your goods. Be cautious and diligent when it comes to choosing a plan. Read the terms and conditions thoroughly and understand what is covered and what isn’t. Often, the homeowner’s insurance or the renter’s insurance covers it, but if it doesn’t – don’t hesitate, get an insurance policy. Keep a record of every item you have stored in the unit. If it’s a huge unit, keep a record in a way so as to help organize the space better. This not only keeps the place looking stacked and pretty, but also helps in cases of insurance claims. Apart from the item’s name, you must also keep a list of corresponding values of items stored. If you have stored electronic items, note down their unique serial numbers. All this can come in extremely handy if you happen to lose your goods or the storage unit is struck by some disaster and you need to claim a refund. Try and maintain a number of photographs as proof as well. Yes, a physical lock and key. It’s always better to be safe than sorry. Though storage units have their lock-down systems, it is best to have your own physical lock. Invest in a good disc lock and secure your belongings. Why a disc lock? Because it’s impossible to cut through it. If somebody tries to pick it, it will make a loud grinding noise thereby attracting a lot of attention, which is good news for keeping your belongings theft-proof. If you are choosing an outdoor storage unit, a lock is a must for you. Remember to keep the keys with you — after all, that’s the point of maintaining a lock, right? In most cases, it is one of the friends or family of the owner that tries to steal important things. To be safe on that front, it’s best to not tell people where you’re storing your valuables. You must never share your passcode or pin with anybody, and if using a physical lock, you must never lend the keys to anybody. When visiting your storage unit, choose to do so alone or with your very close family members. Be very careful of who you bring along with you while on inspection of your units. At Jiffy self-storage, outdoor storage units are as secure as indoor ones. However, it’s preferable to opt for an indoor storage system if you want to eliminate chances of damage due to an easier access location. Typically, an indoor storage unit is protected by keypad locks and is very safe with the added benefit of a number of gates to pass through before reaching the destination. If you’re opting for a temperature controlled or a climate controlled storage unit, you’re secured from environmental threats. If do not invest in one of the above storage units, you must pay special attention to the location, atmosphere, and other environmental factors. Keep a close check on the state of your items. If you see mold or mildew growing on your furniture, it’s time you change the storage unit. It’s particularly important to check the room temperature of the unit when storing artworks. To avoid the hassle, it’s best to opt for a climate controlled storage unit. You can then maintain both the humidity and temperature of the unit to suit your requirements. Place your belongings on a skid rather than placing them directly on the floor. Keep your items wrapped in heavy-duty plastic to prevent dust and insects. Don’t place valuable goods in plain sight, preferably place them behind everything else. Use similar boxes to make stacking easy and make sure they’re not very light – if they’re half empty, the stacks may collapse. Also, avoid stacking too high or else your things may get damaged if they fall accidentally. Arrange goods in a way so that accessibility does not become an issue. It is a good idea to get some shelves to organize your storage unit better. Make sure you don’t put a lot of load on delicate items. Keep an eye on your unit and inspect it regularly. Make surprise visits a habit.